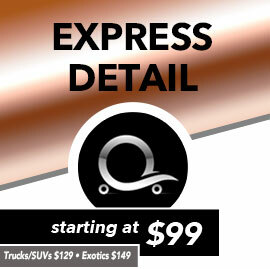 Q Car Care provides industry-leading exterior and interior detailing services. Our detail packages were designed to suit the needs of all clients - from just a quick clean to full blown comprehensive detailing. Only the best products, methods, and equipment are used. *Please note our express details are a light cleaning to spruce up interiors and exteriors. We call it "a detail between details" for cars that received a full detail in the past 3-6 months. For information about our other detailing services, please refer to our Standard Detail and Platinum Restorative Detail. Your bi-annual maintence detail. Includes Express Detail. If your car really needs some love, this is your package. The most intensive cleaning and polishing package we offer brings your vehicle as close to factory new as possible. It's like buying a brand new car. Recommended for exotics and classic vehicles.